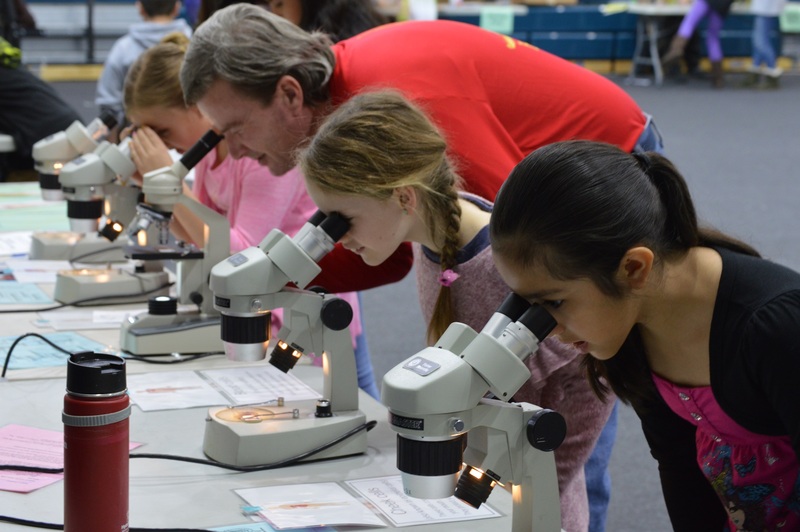 The 14th annual family SCIENCE EXPO for 2019 has the theme of PHYSICAL SCIENCES. Topics included 1) Forces and Motion, 2) Properties of Matter, and 3) Energy. There are approximately 30 different science activities and they include air pressure, gravity, magnetism, properties of water, momentum, physical properties of matter, mixtures, chemical reactions, mechanical energy, sound, light, and heat. Teachers, scroll to the bottom of the page to see NGSS Performance Expectation and activity alignment below. The 2019 North Lake Tahoe Science Expo is on March 18-22, 2019 in Incline Village at the UC Davis Tahoe Science Center with our public event (flyer available) held on Wednesday, March 20th 2019 from 4:00-6:00 p.m. Every year, we are short on volunteers (flyer available). To volunteer for the North Lake Tahoe Science Expo, please click here for volunteer sign-ups. The 4th annual South Lake Tahoe Science Expo is on April 2-5, 2019 in South Lake Tahoe at the Lake Tahoe Community College gymnasium with a public Science Expo (flyer available) held on Thursday, April 4th 2019 from 4:30-6:30 p.m.
To sign up for the South Lake Tahoe Science Expo contact Jodi Dayberry at jodayberry@ltusd.org. There are never enough volunteers for this fun event (flyer available), so please consider joining us and supporting science by volunteering for the South Lake Tahoe Science Expo. The annual Science Expo event is designed to increase student excitement and interest in science through interactive, hands-on activities, games and demonstrations. Science Expo is hosted by UC Davis TERC. Science Expo includes nine days (5 days in North Lake Tahoe and 4-5 days in South Lake Tahoe) of hands-on science activities for third-, fourth-, and fifth-grade students from the greater Lake Tahoe and Truckee Region and an evening public event for families. Interest in the event has grown tremendously. Student groups come for a two-hour session and interact with 30-40 hands-on science activities within the theme of Physical Science (2019), Earth and Space Science (2020), and Life and Health Science (2021). Themes are on a three year rotation to ensure that local students who come every year during grades 3 through 5 will experience different activities each year. The cost is $5 per student. UC Davis staff, AmeriCorps members, Youth Science Institute (high school students) participants, and volunteers share experiments, activities, and science demonstrations with the students in the community. Other regional partners including Sierra Watershed Education Partnerships, Tahoe Institute for Natural Science, Incline Village General Improvement District, Washoe County School District, Lake Tahoe Unified School District, U.S. Forest Service, and U.S. Fish and Wildlife Service also offer activities, experiments, or demonstrations. Coffee on the North Shore is provided for volunteers by I.V. Coffee Lab. Students from Kings Beach, Incline Village, Tahoe City, Truckee and South Lake Tahoe will attend during the school days and there is also an evening public open house on Wednesday evening from 4 - 6 p.m. providing fun for the entire family and a great educational experience for kids (flyer available). Free ice-cream is provided during the public event by Susie Scoops of Incline Village. Teachers should contact Heather Segale at 775-881-7562 or hmsegale@ucdavis.edu to book their time slot for the 2018 Science Expo. The Tahoe Center for Environmental Sciences facility is located at 291 Country Club Drive in Incline Village (between Tahoe Boulevard/SR 28 and Lakeshore) and provides the perfect setting including use of teaching laboratories, a 3-D visualization theater, and other educational tools.